At Mya-Moe, we make nearly 300 ukuleles per year from more than 20 different types of wood. 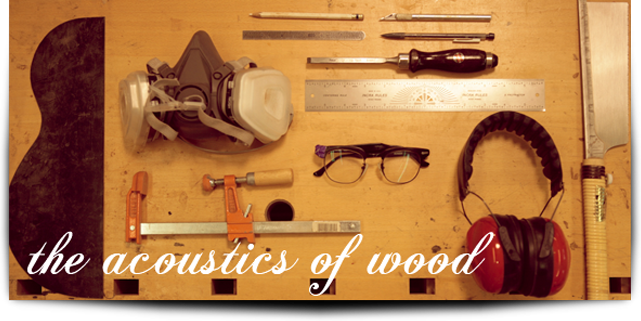 With our endorsing artists, we have extensively tested the acoustic influences of each type of wood. Nearly every customer asks, "does the wood make a difference?" The answer is emphatically, "yes!" In spite of the wood differences, we strive to deliver certain acoustic properties, such as a strong voice and a long sustain, to all our ukuleles. Think of tone along a spectrum: on the left side is warm (and too far left is mushy), and on the right side is bright (and too far right is brittle). Warms woods tend to deliver a more blended tone. Brighter woods deliver greater note distinction, and they tend to have more sustain. In general, woods with higher density (harder woods) are brighter, while lower density woods (softer) are warmer. Keep in mind, however, that each set of wood is unique. Some woods, such as koa, can vary greatly from set-to-set. As luthiers, our job is to adjust the internal engineering of each instrument in order to bring out the best acoustics that set of wood has to offer and match the instrument to the musician. So, in our instrument gallery we use the graphic at the top of this page to show where the wood lies on that spectrum from warmer to brighter. This will allow you to pick a wood which perfectly matches your acoustic and aesthetic desires. The warmest wood we work with is koa, with mahogany as a close second. The brightest woods we work with are the maples, with many ebonies slightly warmer. Most of the exotic imported woods (e.g., pau rosa, palo escrito) are on the brighter side of the spectrum. In the middle of the spectrum are mango (warmer side of middle), myrtle (middle), sycamore (middle), and walnut (brighter side of middle).